There are two camps out there when it comes to spicy foods – you either run away screaming when someone mentions even a hint of heat or you crave it with the fury of a thousand suns. I lean more towards the latter side of the spectrum, but with the stipulation that adding spice for the sake of activating the capsaicin receptors on my tongue to the point of maximal discomfort just because is just not my thing; if it doesn’t add to or enhance the flavor of a dish, it’s just not worth the pain! My go-to for adding heat to a dish used to be a drizzle of sriracha on everything (and I mean EVERYTHING), but lately I’ve been turning to gochujang, or Korean fermented hot pepper paste for all of my hot sauce needs. It’s easiest to think of gochujang as the Korean version of sriracha, although it is so much more than that! It is made from a combination of red chili peppers, glutinous rice, fermented soybeans, and salt. Traditionally, it is used in Korean cuisine both as a condiment for adding flavor to more bland dishes and as a staple ingredient in dishes that bring the heat. It is also frequently mixed into other Korean condiments, such as chogochujang (gochujang + vinegar + sugar + sesame seeds) and ssamjang (gochujang + onions + spicy seasonings). Basically, it’s a mix of umami, sweetness, spice and just an all around hit of BOLD flavor. In my opinion, it has a lot more flavor complexity going on than sriracha does, which is why I tend to favor it when spicing up my meals! 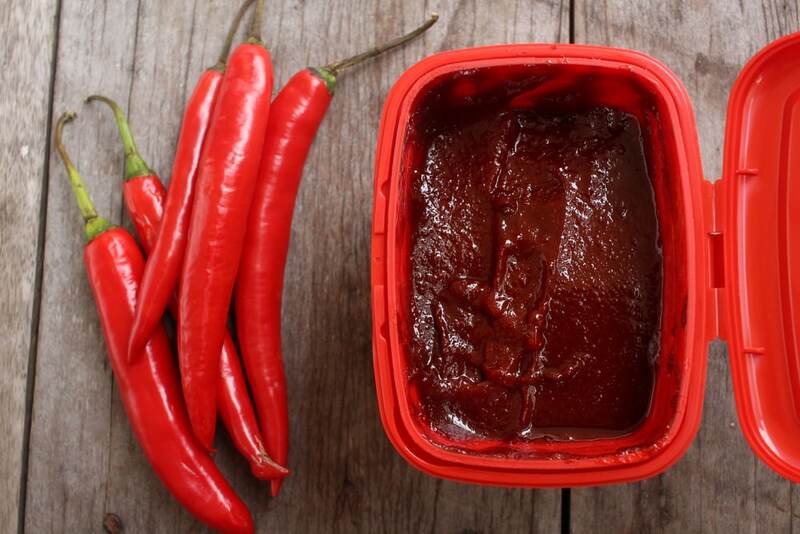 Unopened jars of gochujang can be stored at room temperature, but once opened it should be stored in the fridge. Ummm, on everything? I have stirred it into soups and stews, used it to make stir fry sauces, mixed it into scrambled eggs, added it to pizza sauce for some funky spiced up flavor, and whisked it into salad dressing. Suffice it to say, I’m pretty sure there is no wrong way to eat it. Super-Refreshing Agua Fresca Recipes for Summer What is Escabeche? I loveee gochujang and have used it for soups, hummus, and as a spread. I recently discovered gochujang at my local grocery store and its really good. ( Looks like the one the picture). I don’t like things very spicy either but this adds just a touch of yummy heat. The more I eat it the more I am liking it and would recommend everyone to try it. It goes good on just about everything. Thanks for the good article! Love seeing gochujang everywhere these days, though it’s a bit odd for me since it’s something I grew up with!